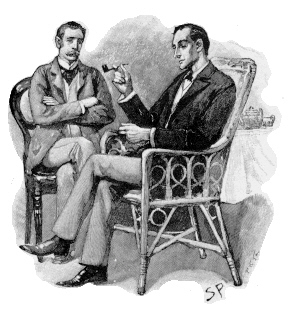 Two days ago, Barbara Early gave us a fascinating post about Sherlock Holmes and his many incarnations. And, truly, Holmes has been a quite popular character since Sir Arthur Conan Doyle created him in 1886, and there are a great many I enjoy. 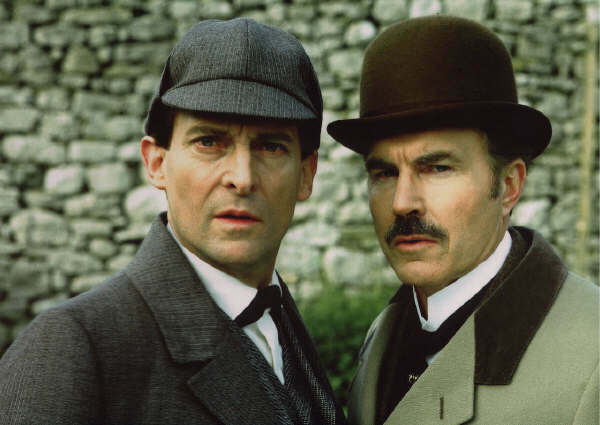 But I have to admit I was surprised to see that Barb's post did not include the Sherlock Holmes, Jeremy Brett. Brett played Holmes from 1984 through 1994 in the TV series of Sherlock Holmes adaptations produced by British television company Granada Television. 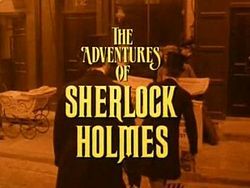 The first two seasons were titled The Adventures of Sherlock Holmes. 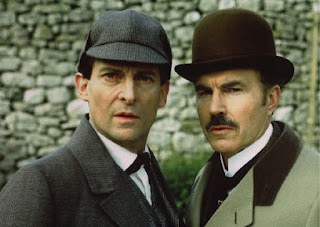 Later came The Memoirs of Sherlock Holmes, The Return of Sherlock Holmes and The Casebook of Sherlock Holmes as well as five feature-length specials. By the end of the series, Brett had played Holmes in 42 adaptations of Doyle's 60 Sherlock Holmes stories. Quite a feat! One thing I particularly appreciate about these adaptations is that (with a few notable exceptions) they obviously take great pains to stay faithful to Doyle's stories. Much of the dialogue is taken directly from Doyle's work, and the sets and costumes seem as if they could be from his time entirely. And the closing credits are ornamented with the original illustrations used when the stories first appeared in The Strand Magazine. And, especially in the early episodes before his health began to decline, Brett looks very much like the lanky, hawk-faced Holmes of those illustrations. He gives the character the calculated coldness one might expect, but there is also a fevered energy and poignancy to his performance. His Watson, David Burke (and later Edward Hardwicke), is also much closer to Doyle's capable ex-soldier/physician character than the one portrayed in some adaptations (particularly the lovable but bumbling Nigel Bruce who was Watson to Basil Rathbone's Holmes in the films of the 1930s and '40s). The series ended when Brett passed away due to heart failure in 1995. But it seems likely that, since he had been seriously ill during the last of the series, he would not have continued anyway. I am glad that he has left us such faithful and enjoyable adaptations of Doyle's stories. For me, he will always be Doyle's Sherlock Holmes, the Sherlock Holmes. Who's your favorite Sherlock Holmes? Why? Do you like adaptations of books that are extremely faithful or do you think film makers should make improvements as they see fit? Thank you for this wonderful post, DeAnna! 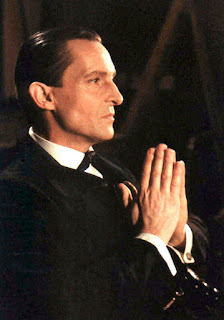 I agree with you, Jeremy Brett is "THE" Sherlock Holmes. My mother and I watched the program together, and we never missed and episode. We both loved it! Isn't it a great series? I wish more adaptations of literature, especially the classics, were so faithful to the original. I missed out on this one, too. I'm going to have to search Hulu for some of these episodes! As for adaptations of literature in film or television, I think no matter how closely the book is followed, adding actors and actresses and directors and set designers, all with their own perception of the story being told, almost guarantees that the finished product won't be "exactly" like the book. But that's probably also why we get to enjoy so MANY different adaptations of the classics! My favorite book to movie adaptation is probably the first of the Narnia series. Well, true. Readers always have their own ideas about how a book should "look." The director can only present his vision of it. I LOVE the Narnia books and movies. I agree that the first one was a particularly good adaptation in most respects. And so beautifully crafted. I apologize for leaving out Jeremy Brett! I could not be comprehensive anyway, so I focused on the earliest,the one I was most familiar with, and the most recent. And speaking of BBC adaptions and Narnia--has anyone seen the BBC version? It doesn't have all the computer enhanced graphics (like a guy in a beaver suit instead), but I remember liking it--at least before the new movies came out. I enjoyed (and own) the BBC Narnia version. I thought, for its time, it was well done. I haven't watched it in quite a few years but should bring it out again! I like the BBC version of Narnia because it's SO faithful to the books. But oh, those not-so-special effects kill me every time! I haven't seen many Holmes shows. I saw two versions of Hound (s?) of the Baskervilles and enjoyed them both even though they were kind of campy. One was very old and one was probably made in the 80s or 90s. Even yhough I love Downey Jr, I couldn't get past the opening of the first Sherlock and haven't tried to eatch the second. I know you're all asking, "What is wrong with her?" Believe me, I ask myself that, too. I think part of it for me is that I can't always hear the British accents without turning the tv too loud.